By Woody from La Plata, Mo. 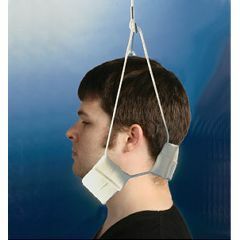 Disposable Head Halter for chin and occiput. Deluxe, extra-comfortable, perspiration-absorbing padding. Use with Deluxe Overhead Traction (#60379) and Exo-Bed Traction Unit (#60377). 20-lb Water Weight Bag sold separately. Most comfortable head halter that I've ever owned.